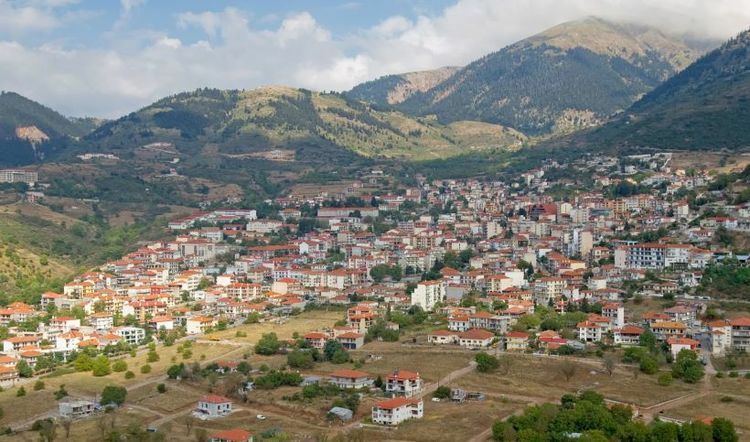 Karpenisi (Greek: Καρπενήσι) is a town in central Greece. It is the capital of the regional unit of Evrytania. Karpenisi is situated in the valley of the river Karpenisiotis (Καρπενησιώτης), a tributary of the Megdovas, in the southern part of the Pindus Mountains. 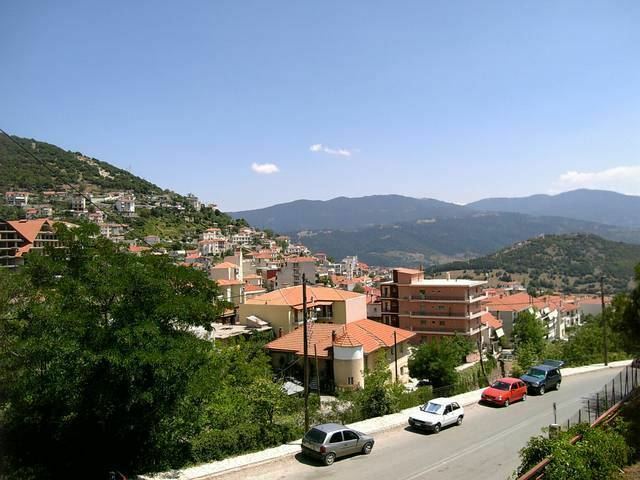 Mount Tymfristos (2,315 m elevation) lies directly to the north of the town, and the foothills of mount Kaliakouda are in the south. Karpenisi has a ski resort and is a popular destination, especially during winter. It is called Switzerland of Greece for the resemblance with the mountainous country and its beauty, atypical for a Mediterranean place. According to Homer, the first known inhabitants of northern Evrytania were the Dolopes, who took part in the campaign against Troy around 1100 BC. The ancient capital of the area was Oechalia, situated close to the city of Karpenisi. Ancient Evrytanians especially honored Artemis, the goddess of hunting and Odysseus for his ability to be cunning and inventive. There are two possible explanations for the origin of the name "Evrytania". The first is that is formed from the Greek word "ev" for "well" and the verb "chreo", for "flow" so that altogether the word "Evrytania" means the place where there is plenty of fresh and "well flown" water. The second explanation for the names origins, comes from the verb "evryo", meaning "stretching the cord of the bow", hence the name of the first king of the area, Evrytos, who was an excellent archer. In the Roman period, the area became better known, especially after the battle between the Roman and the Aetolian League (Greek) armies, in the location of "Kokalia", which ended in favour of the former. During the Byzantine times, the people of Evritania had the rare privileges of self-government and tax exemption. For this reason the northern part of the district was also called "Agrafa" (unwritten), because the residents were not listed in the Imperial tax registers. During the Ottoman rule of Greece, this area remained relatively free, especially the very remote areas in the mountains. For this reason, the population of the villages grew. During the 18th century a famous school was created here by Evgenios Yannoulis the Aetolian, a school which had a great contribution in awakening the ethnic consciousness of the nation. The Turks and Albanians raid the territory many times. However one of the turning points, at the historic site of Kefalovryso, on the night of 8 August 1823, was when General Markos Botsaris was killed by the Turkish army sent by the Sultan to stop the Greek Rebellion. The Greek troops won the battle and, although the great shock from the death of the hero at first, the soldiers were to fight more bravely from then after. During the Second World War, when German and Italian troops occupied the country, the National Liberation Front (EAM) resistance movement established a government, the Political Committee of National Liberation (PEEA) in the village of Viniani in spring 1944 and it proclaimed elections for a National Council, which was convened in the village of Koryschades in May with representatives from all over the country. Throughout its history, due to warfare, Karpenisi has been ruined and rebuilt many times; the last act of destruction was carried out by Wehrmacht General Hartwig von Ludwiger in 1944 in an effort to annihilate the supposed center of EAM resistance. This in an unremarkable market town in the middle of Roumeli, notable less for its own merits than for what's around it. The chief attraction, in fact, is the Karpenisi Ski Centre eight miles out of town on Mount Velouchi, perched nearly 6,000 feet above sea level at a spot called Diavolotopos – literally, Devil's place. This centre has ten pistes, seven ski lifts, the requisite number of restaurants and first aid facilities, and a stunning view of a good part of the central Greek mountain tops. While far away from the sea and the popular tourist destinations of the islands of the Aegean and Ionian, Karpenisi has become an important ski and outdoor sports center. The municipality has an area of 948.570 km2, the municipal unit 250.887 km2.